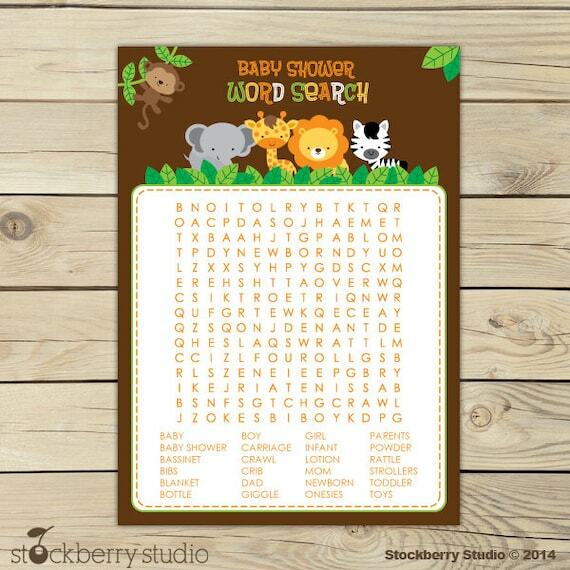 Word Search Printable Baby Shower Game Safari Animals. Print digital file and use for a baby shower game. ►This product listed is a digital download. No product will be physically shipped to your home. Please read all the Terms & Use information below carefully before you make your purchase. A download link will be sent INSTANTLY to your EMAIL ACCOUNT you have on record with ETSY within 5 minutes AFTER your payment is completed for you to access the files. Please DO NOT leave YOUR EMAIL ADDRESS in the NOTE TO SELLER are during checkout. This is an automatic DIGITAL DOWNLOAD & it will be sent AUTOMATICALLY to the email address you have on file with Etsy. Thank you!. Files WILL NOT be physically shipped to your home address. The download link will be sent to the email address you signed up with for your Etsy purchase. ► STEP ONE: Check your EMAIL ACCOUNT (.com) the email address you have on record with Etsy. ► STEP TWO: Check your SPAM/BULK folder. ► STEP FOUR: Check your ETSY CONVERSATION account. It's your Etsy email account when you sign into Etsy the envelope icon at the top of the website. If you followed all four steps please send an ETSY CONVERSATION with your order number and let me know you haven't received it. Your will receive a DIGITAL file that will be sent to your Etsy Conversation electronically with a link to download the NON-EDITABLE PDF* file. The file format is a NON EDITABLE PDF formatted for 8.5 x 11 inches sheet of paper. The PDF file is NON-EDITABLE and password protected and CAN NOT be edited or opened in other program except for Adobe Acrobat Reader. The file can ONLY be opened and printed from ADOBE ACROBAT READER a free program www.adobe.com. You WILL NOT be able to open the files up in any other program and edited the design, layout, pattern, color, font or resave it as a different format such as JPEG, EPS, PNG, SVG and etc. The original editable source files are NOT FOR SALE so you can edit, add text, change colors, patterns and etc. Software requirements for printing the ***NON EDITABLE*** password protected PDF is Adobe Acrobat Reader a free program you can download at www.adobe.com. The color quality will vary depending on the type of printer and a paper you will use. The samples shown in the photos were printed on a home inkjet printer with the ink settings changed to 'best photo' in the printer dialog box properties tab. All printable party packages PDF files are PASSWORD PROTECTED you WILL NOT be able to change any graphics, patterns, font, colors and etc. ALL PARTY PRINTABLE PACKAGES & PRINTABLES ARE FOR PERSONAL USE ONLY and CAN NOT be resold for any purpose. YOU CAN print as many print out as you need for your PERSONAL USE ONLY using Adobe Acrobat. All artwork is original created and copyrighted by Stockberry Studio. You MAY NOT sell this party package as a PRINTED OR DIGITAL item. The printed color result of party package may vary depending on your printer and the setting. Please set your printer on the photo quality or best quality in your printer dialog properties area. Due to the digital nature of ITEMS, there are NO REFUNDS OR EXCHANGES on items delivered electronically. IF YOU AGREE WITH THE TERMS ABOVE PLEASE PROCEED WITH YOUR PURCHASE.